You are currently browsing the tag archive for the ‘barnyard’ tag. ‘Farm Frolics’ was the second Merrie Melodie directed by Bob Clampett. 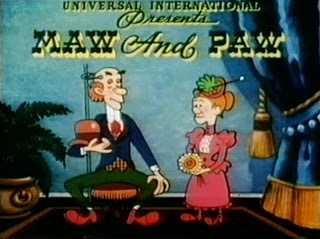 In this cartoon Clampett follows Tex Avery with his own spot gag cartoon, this time on farm life, making it strangely similar to the Walter Lantz cartoon ‘Fair Today‘ from only three months earlier. The Warner Bros.’ spot gag cartoons rarely belonged to the best of their repertoire, and ‘Farm Frolics’, too, is hardly funny. Even the running gag of this forgettable cartoon is trite, and fails to provide a welcome finale. Nevertheless, the animation is very fine. For example, there’s some surprisingly realistic animation on a horse. Thus even this weak short shows that by 1941 the Warner Bros. animators could do almost everything. ‘Barnyard Brat’ is the third of seven cartoons featuring Hunky and Spunky, arguably the worst comic duo ever put to the animated screen. 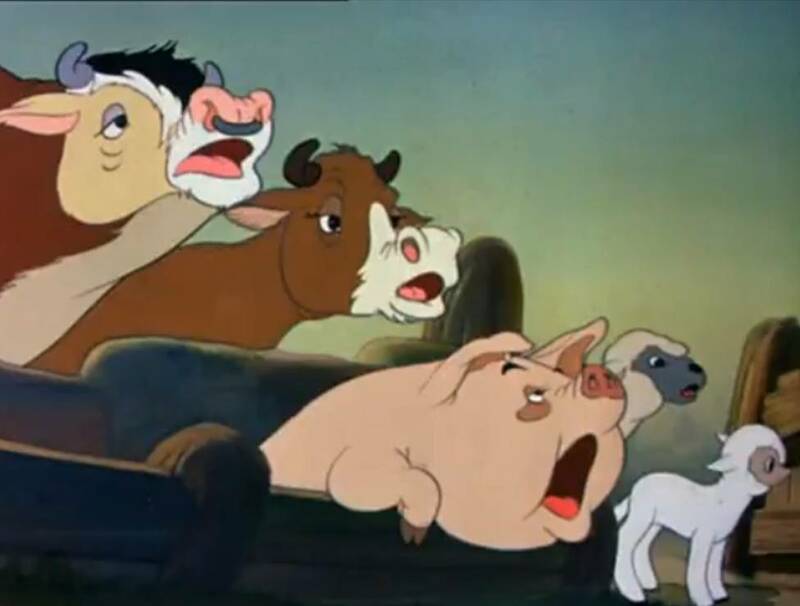 It may be clear that like ‘Small Fry‘ and the other Hunky and Spunky cartoons ‘Barnyard Brat’ belongs to the childish and cloying cartoons that had swamped the second half of the 1930s. By 1939 these were more and more replaced by gag cartoons. None of that, in ‘Barnyard Brat’, although there’s one mildly amusing gag of two ducks running away while stuck together in a pipe. Besides the cloying story, the animation is rather poor. Spunky looks as if he’s seriously misshapen, and there’s some thinking animation on Hunky that’s anything but convincing, and cannot match that of Pluto in ‘Playful Pluto‘ (1934). Since that cartoon was already five years old by 1939, this only shows the Fleischers’ incompetence to catch up with the Disney style, and one wishes they never even tried this, for the Disney style would never become their strength. Besides, Warner Bros. and Walter Lantz were already showing that this copycat behavior wasn’t necessary for success. While other studios, like Walter Lantz and the Max Fleischer drew inspiration from jazz, and while Warner Bros. could draw from an extensive music catalog, in the early sound days Walt Disney turned to (copyright-free) folk songs and classical music. After ‘The Opry House‘ (1929) and ‘Just Mickey‘, Mickey’s concert career reaches new heights in ‘The Barnyard concert’. In this highly enjoyable cartoon Mickey conducts a barnyard orchestra in Franz von Suppé’s overture to ‘Dichter und Bauer’. There’s one throwaway gag looking all the way back to his breakthrough cartoon ‘Steamboat Willie‘ (1928),in which Mickey torments some pigs, but most of the cartoon is forward looking. Indeed ‘The Barnyard Concert’ looks like a blueprint for ‘The Band Concert‘ (1935), in which many of the gags introduced here are improved to perfection. The cartoon features no dialogue, whatsoever, but is full of clever sight gags. Unfortunately, at this stage the animators still had problems with Mickey’s eyes: in one close-up in particular they are placed awkwardly in Mickey’s face. ‘Mickey’s Follies’ is the first Mickey Mouse film with his own name in the title – a clear indication that the mouse himself now was star enough to sell his own cartoons by name only. In ‘Mickey’s Follies’ Mickey and his friends are giving a concert on the barnyard. First we see five dancing ducks, then a rather tough ‘French Apache dance’ between a rooster and a hen, followed by a pig singing in an ugly operatic voice. This pig is probably the first character in animation history to be funny because of a typical voice. Highlight, of course, is Mickey himself performing his own theme song, titled ‘Minnie’s Yoo Hoo!’. This theme song clearly is the raison d’être of the cartoon, and it is even announced as such. No doubt this song was introduced as part of Mickey’s merchandising – and meant to be sold as sheet music, being the first Disney song to do so. An instrumental version of ‘Minnie’s Yoo Hoo!’ would indeed become Mickey’s theme song and accompany the intro’s of many Mickey Mouse cartoons to follow. ‘Minnie’s Yoo Hoo!’ was Disney’s first hit song, and the start of a long tradition, which hasn’t ended yet, as manifested by the huge hit ‘Let It Go’ from ‘Frozen’ (2013). Disney’s attention for merchandizing made him a lot of money, and allowed him to invest more money in his cartoons than his competitors, enabling him to maintain the lead in the animation film world throughout the 1930’s. Unfortunately, the cartoon’s focus on Mickey’s song makes it rather one-dimensional and dull. It’s an early example of a Disney song-and-dance routine cartoon, one of the first of seemingly countless such cartoons the studio produced between 1929 and 1931. ‘Mickey’s Follies’ is Disney’s second serious attempt at lip synch, after ‘The Karnival Kid’. Mickey sings much more than in the former cartoon, and the all too literal mouth movements give him many awkward facial expressions. Later the animators would learn to tone down the mouth movements, keeping Mickey’s face more consistent without losing the illusion of speech. ‘Mickey’s Follies’ marks the director’s debut of Wilfred Jackson, who had joined the Disney Studio as an assistant animator in April 1928. He was the first to replace Walt himself as a director. Jackson would have a long career at Disney’s studio: he directed his last film, ‘Lady and the Tramp’ in 1955, 26 years later. He retired in October 1961. During a chase at the barnyard Jerry seeks shelter with a large and angry chicken. This short contains the very first example of the extreme cartoon violence that would become so typical for the Tom and Jerry series: the scene in which Jerry tries to cut off Tom’s head with a pair of hedge-shears. The short’s highlight, however, is Jerry’s Josephine Baker-like dance with yellow feathers when he’s trying to disguise himself as a little chick. 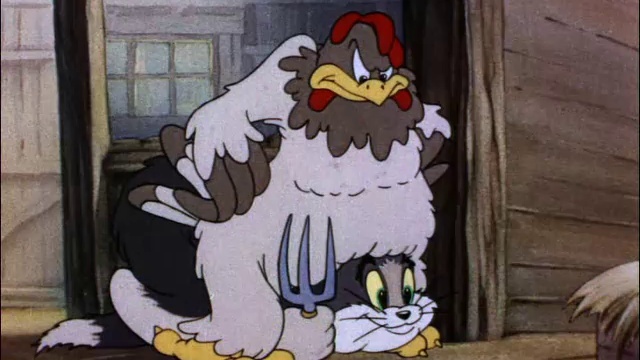 ‘Fine Feathered Friend’ is the first Tom & Jerry cartoon to start with their familiar opening tune.